Do you know someone recovering from surgery? Or maybe they are just under the weather. If you've ever wondered what to send them, why not consider a get well candy bouquet? Soup and crackers are a thing of the past. Send your family or friends a get well candy bouquet and brighten their day instantly. I know firsthand that it is tough to watch a family member or friend struggle when they are not feeling well. My sister has had surgery after surgery on her heart and I always feel awful that I can't do very much for her. It's not like I can get the surgery on me, right? Still, she received lots of get well gifts (balloons, teddy bears, cards, etc.) but nothing too special. She's been through a lot and deserves something better than the same old stuff. Above and beyond all the usual gifts, there are get well candy bouquets. They are built to look like a regular flower bouquet, but instead of flowers there are all different kinds of candy bars and treats! How fun is that? I know that I, for one, would much rather prefer a candy bouquet to a bunch of flowers. Sure, they are pretty - but candy is tasty! Plus, you can share it with friends or family that come to visit you. It's a win-win gift. Another thing that's nice about a candy bouquet is that they don't expire quickly like a fruit gift would. And it's not fragile like flowers would be. These are all nice perks when considering a gift! Some candy bouquets even come with a little jazz, such as a get well balloon, or a little coffee mug as the vase. The options are really endless, and if you want to make it even more special, why not spruce it up a little bit yourself? You can add rhinestones to the vase, or add in a few flowers to the mix. Get creative and make it even more extra-special than it already will be. This variety pack includes: # Snickers - 10 ct. # Snickers Almond - 3 ct. # 3 Musketeers - 3 ct. # Twix - 8 ct. # Milky Way - 6 ct.
Hershey's Assorted Standard Bar Variety is a chocolate candy. Its a classic full size candy bar. There are so many varieties of candy that are used in candy bouquets. And although the name is 'candy bouquets', it doesn't always have to be strictly candy. Here are some examples for what could be included in your gift. This makes for a great get well gift for a child, just make sure that you clear it with Mom or Dad first, so that they're not upset when the sugar-high sets in! Would you give a candy bouquet? What a cute idea - love the band-aid covered gift box! 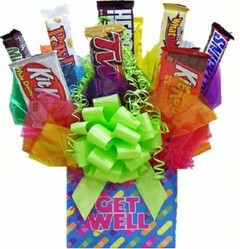 What a great idea, I know I would much prefer a fun candy bouquet for a get well far more than flowers or the like. Its such a happy gift and one you can enjoy sharing with visitors and guest who show up. I also think this makes a perfect way to cheer up anyone's day for any event or occasion.